Itzy3D Free iPhone Game Review. When we think about spiders, most of us tend to be disgusted or scared. But there is one spider, that isn't looking to hurt anybody. Well, almost anybody. It's just trying to knit his webs to catch enough flies to regain its strength. And for that, it needs your help. All you have to do is download the free version of Itzy 3D from the AppStore and go along with Itzy in its journey through forests, farms and more. Itzy 3D is all about knitting spider webs, while avoiding to get stung by bees. The bigger the web, the more flies will get caught in it, and the more material for knitting other webs will your Itzy have. 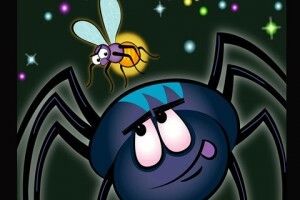 The rules are simple: you have to help Itzy knit spider webs to catch flies. And Itzy needs to catch flies to make more material for knitting webs. It kind of sounds like a vicious circle, but it's easier than it seems. 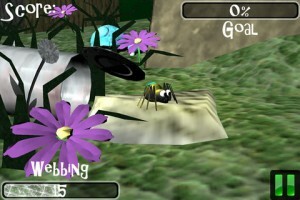 Once you start the game, you have enough material to knit one large spider web or a couple of little ones. You can knit Itzy's spider web wherever you want, as long as it's not on the ground or on the back of some living creature. Trees, caves, fences and even old pieces of furniture and cars, on the other hand, make great knitting spaces. However, knitting spider webs is not danger free. The bees are Itzy's worst enemies and they will pop out when you least expect to see them, prepared to sting you. Fortunately, there's a trick that can help Itzy protect himself every time, without having to run away from them. Just double-tap anywhere on the screen and he will instantly become invisible. When the coast is clear, you can continue the knitting where you left it. Playing Itzy 3D means going through 4 levels in the free version plus the possibility to play 6 more via InApp Purchases at the price of $0.99 or $1.99 each. Plus, you can choose from 3 difficulty levels to make your task as easy or as challenging as you want it to be. As you clear each level, you'll unlock achievements and get bonuses that will increase Itzy's speed or the stretch of his web. Itzy 3D also has Facebook support, so that you can share your results with your friends, any time you get a new achievement or a really high score. The free version of the game will keep you busy for a few hours. If the game really caught your attention, you can play more by purchasing additional levels or buying the full game for the price of $4.99. I can't help but compare the price of $4.99 with some incredibly amazing 99 cent games in the AppStore, and I fail to see whether the money is well spent. Itzy 3D is missing that certain something that makes you look forward to unlocking another level. Unfortunately, all the levels have the exact same ingredients and it’s like playing the same level with different backgrounds, no extra challenges. Whether you only play the first level or all 10 of them, you get no satisfaction. Itzy 3D is too repetitive for my tastes. I got enough of it after playing the first 4 levels in the free version. Another disappointing aspect regards graphics. If I were to say that Itzy 3D has great graphics, then that would mean offending games like Infinity Blade II and even Temple Run. There's nothing creative about the shapes designed in these backgrounds. 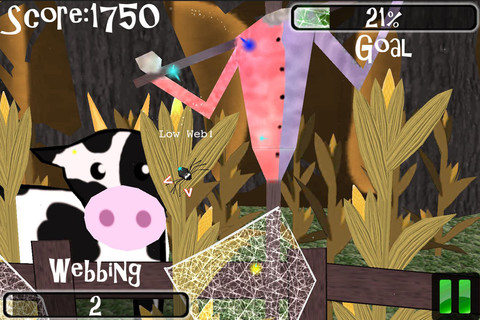 A couple of shapes with wooden texture don't make a forest, and a 2D moving cow doesn't make a farm. Don't get me wrong. The graphics would have been ok for a children's book, where it's more about the educational purpose of the app than the design. But with such a static game, you would at least expect a nice background, taking into consideration the fact that Itzy 3D is not cheap at all. At the end of the day, Itzy 3D will grab you for a level or two, but it will be up to everyone's tastes if you purchase any additional levels. It can make for a mediocre arcade game, but it's nowhere near as beautifully designed, cleverly thought and addictive as it should be. What do you think of Itzy3D ? Scroll down for our comment section and let us know! Just a quick note, there's also a free version available as well. If the price is the issue, you can play the first 4 levels for nothing. Free is good.